For years the band was a Greek-speaking heavy / rock band with discography. The band was called “Pyr kai Mania”. The same members decided to form a metal band with English verse, so in 2006 Jim (Guitars) and Mario (Vocals) formed The Silent Wedding. The band’s name means a “Secret Agreement”, combining all the diverse music influences of the band members. The band started playing live gigs performing their own songs and various covers, sharing the stage with many well-known metal bands and participating in many heavy metal festivals around Greece. In 2007 they entered Underground Music Studios in order to arrange record their first songs. In 2008 The Silent Wedding recorded their first EP including 4 compositions and a live cover of the song “Sleeping in the Fire” of WASP. The band released the EP in 2008 and received positive feedback from magazines (Metal Hammer, Rock Hard etc), radio stations and international webzines. 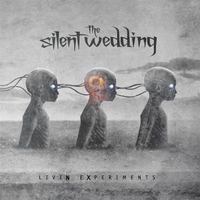 The reviewers described The Silent Wedding as a "Heavy Metal band with Prog & Power influences". In 2009 their new song “General Autopsy” was included in the compilation of Rock Hard Magazine “Greek Power Vol.1”. The song was also included in the second release of “The Silent Wedding” EP one year later. The band started working on its debut album which was completed in 2012. The album entitled “Livin Experiments” was recorded and mixed at Underground Music Studios (GR) and mastered at Gate Studios (DE) by Michael “Miro” Rodenberg (Kamelot, Edguy, Rhapsody etc.). For the album cover the band worked with Travis Smith (Nevermore, Iced Earth, Opeth etc). Meanwhile, the band keeps promoting its work through live shows around Greece in metal festivals (Hellenic Heavy Metal bands fest, Golden Apple Fest, Ayia Napa Youth Fest etc. ), sharing the stage with bands like Fates Warning, Firewind, Maiden United, Visions of Atlantis and many more, aiming to gain experience and a “strong” fan base. In December 2012 the band supported Maiden United on their mini tour in Netherlands with Perttu Kivilaakso (Apocalyptica) as a special guest. The Silent Wedding signed a record deal with FYB Records (Belgium) and released their debut album “Livin Experimens” on April 6th 2013. The album was reviewed by numerous magazines and webzines receiving remarkably positive feedback, scoring 8/10 in Metal Hammer. The band’s headling release show in Athens was sold out and “Livin’ Experiments” made it to the "Best Seller Metal CD” list in Public Stores (the biggest CD Stores in Greece & Cyprus). In September 2013, a second mini tour with Maiden United took place, followed by a “Livin’ Experiments” release show in Tilburg (NL). In the same year Jimmy (Guitars) and Johnny (Keyboards) joined the band of Eve's Apple (featuring vocalists of Delain, Tristania, Sirenia and many more) for a headlining show at Metal Female Voices Festival in October 2013.